In the spirit of the back-to-school season I headed up to Nederland to ride Super Magic Bus on a late summer day. At the front of the ride is a bit of descent overlooking peaks to the west, and then a relatively gentle climb for a few miles. After that, it’s fun flowey downhill through really tight trees. On one occasion my handlebars whacked a tree and I nearly went off the bike. At one point I passed over a section that had odd and unofficial signage about potential mercury tailings in the soil. This trail has an old school bus off the path, and as I got closer to the bottom of the descent I wondered where it was. Then I saw the glint of yellow out of the corner of my eye, and headed over to check it out. 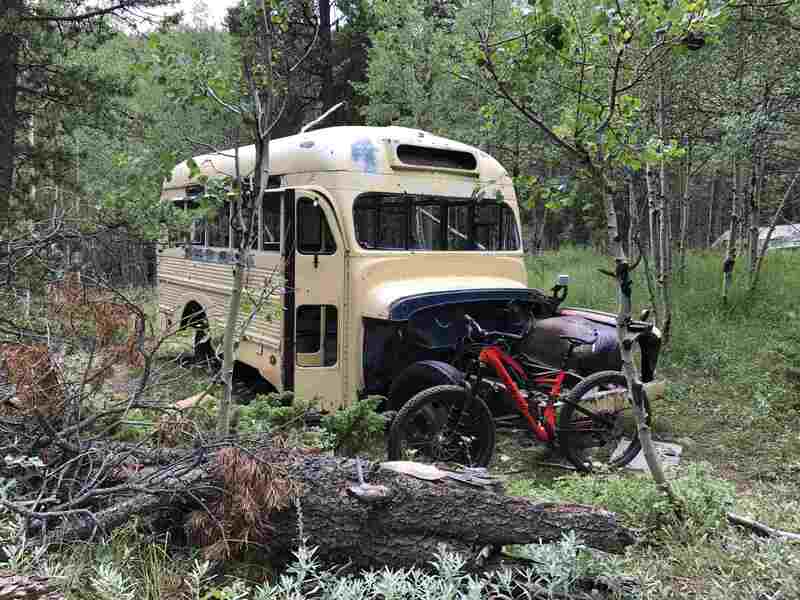 The bus is near an old abandoned shack in the middle of the woods. It’s actually a little creepy (I just watched Blair Witch this past weekend). Today we did a summer hike above Vail on Shrine Ridge, and the wildflowers are still strong. On our 16th day we completed our CT adventure and descended 8,300 ft into Durango. In total, we had traveled 420 miles and climbed over 60,000 ft in accumulated elevation. We awoke to cloudy skies and continued our ride along Indian Trail Ridge. At the top of the ridge the trail took a sharp left and began a steep descent down to Taylor Lake. I said to Kyle that this lake was a reminder that we would like to have my daughter Taylor on this trip, but alas, she just graduated from Boston U and has a real job. We then started down Kennebec Pass over a steep talus field. Riding on talus is challenging and takes practice. It’s like riding on marbles. Kyle wasn’t happy but dealt with it. This part of the trail is really fun as you ride next to the Flagler Fork creek. At one point the trail darts left, and all of a sudden you are in front of a 100 ft waterfall. As you further descend, you come upon a cliff and beautiful view of the valley below, named for Gudy Gaskill, the ‘Mother of the Colorado Trail’ who passed away last year. She was instrumental in establishing the trail in the 70s and 80s and was an icon in the Colorado mountaineering community. After what seemed like an eternity of descending, we spotted our car in the CT parking lot with Cris waiting with beer and soda. Again I want to say we couldn’t have done this without her – setting up hotels, getting us food and water, washing our clothes, putting up with our serious multi-day trail funk. Thanks so much hon! We had actually done it. As I write this days later I’m still a bit surprised. We traveled 420 miles and ascended 60,000 ft through rugged mountainous terrain without injury, rode the best singletrack in the world, saw epic views every day, drank water out of streams and ponds, chased a marmot in the trail, helped a guy with a shattered shoulder get help, bumped into friends in the middle of the forest, met really cool people on the trail, gave a water system to hikers in need, got soaked in daily thunderstorms, and laughed ourselves silly every night in our tent which served as an effective dutch oven after a “delicious” meal of Mountain House and Whole Foods burritos. On our first day my friend Eric said that as a father and son we will have something that we will remember till the end of our days. He was right.